Okay. I never, ever, ever in my life thought I would be endorsing canned chili, yet here I am. 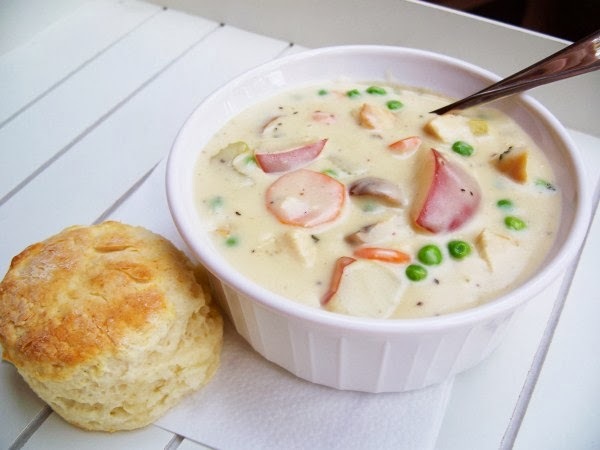 Some nights you just want something quick, easy, and hot and this casserole delivers. And it tastes good! When my hubby reheated some leftovers at work, people were commenting on how good it smelled. My daughter ate every last bite on her plate. This recipe is adapted from one I found on LoveBakesGoodCakes. If you are simply disgusted by the thought of using canned chili, you can make your own following the original recipe. As for me and my house, we are okay with using canned chili a couple of times a year for the sake of saving time and energy. Especially since, for me, making good homemade chili is a several hour affair. And I looked at the ingredients list of the Hormel brand and it wasn't terrifying like I thought it would be. Totally normal stuff! Not a single ingredient you couldn't pronounce or wouldn't use otherwise. And it's cheap. Preheat oven to 400 degrees. Place tater tots in a 9x13 casserole dish and bake for 25 minutes. While tots are baking, heat chili in a pot over the stove or in a microwave-safe bowl. 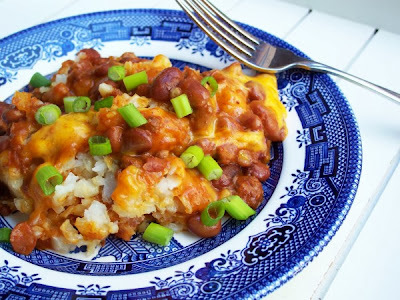 Spoon chili evenly over baked tots and sprinkle with cheese. Return to oven for 10-15 minutes or until cheese is melted and casserole is heated through. Sprinkle servings with green onions and dollop with sour cream, if desired. 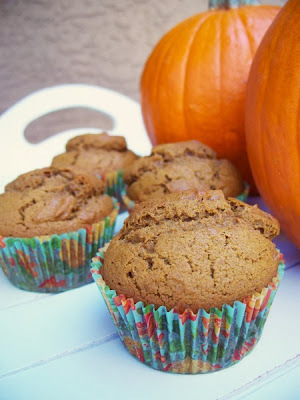 Yep, it's that time of year when all things pumpkin surface on the food blogs. I don't mind a bit because I think of pumpkin as a comfort food. These muffins are a great way to share that comfort with others. They bake up pretty and are nice and moist. I promise these will not disappoint! Preheat oven to 350 degrees. Grease or line a muffin tin. In a large bowl, beat together brown sugar, butter, and molasses. Add egg and pumpkin puree. Beat in remaining dry ingredients, just until moist. Fill muffin cups about 3/4 full and bake for 20 minutes. Makes 1 dozen. I love a spicy cookie. That's probably one of the reasons I love fall and winter food so much. 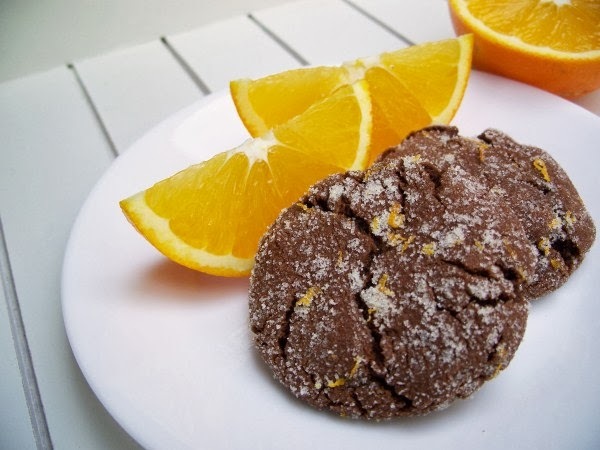 Not that it needs to be fall or winter to enjoy these cookies. These are good any time. I've discovered a way to make them semi-healthy: I make them with coconut oil. Coconut oil is great for baking, though I don't use it in all of my recipes because the coconut flavor does linger. However, in a recipe like this, with spices that mask the coconut flavor, it works great. The cookies are nice and chewy and deliciously spicy. Preheat oven to 350 degrees. In a large bowl, beat together coconut oil and sugars until creamy. Add vanilla and eggs and beat until smooth. Add the baking soda, cinnamon, cloves, and salt and slowly add in the flour until combined. 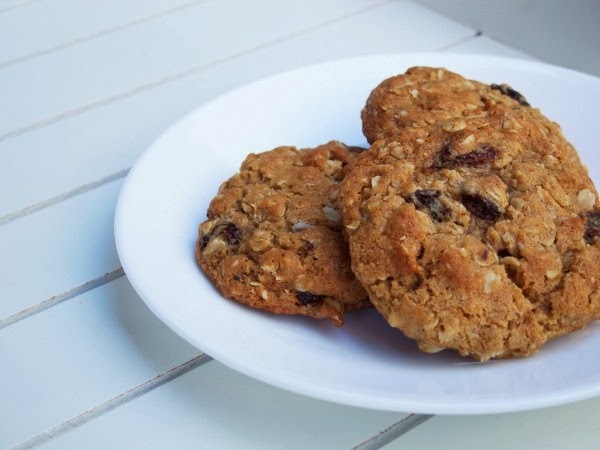 Mix in oatmeal, raisins, and almonds (if using). Drop by rounded teaspoonfuls (or use a medium cookie scoop) onto ungreased or parchment-lined baking sheets. Bake for 8-10 minutes until light and golden. Let cool for 2 minutes on baking sheet before removing to wire rack. Store in an airtight container. Makes about 3 dozen. * The coconut oil can be replaced with 1 cup butter or shortening or a combination of the two. 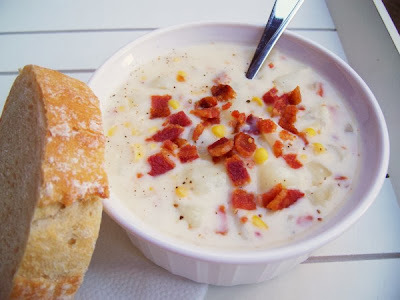 This recipe was posted back in January of 2011. I found it on OurBestBites, one of my favorite food blogs. 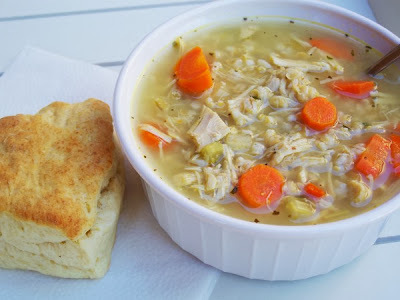 Since posting, I have come up with a quicker way of getting this soup to the table, so I've altered the recipe a little - not the ingredients, just how it's put together. A tip for cooking bacon: line a cookie sheet with heavy duty foil. Lay bacon on cookie sheet and bake at 400 degrees. Check it after 12 minutes and continue baking until desired doneness. The result? Perfectly cooked bacon without all the mess (since you can just wrap up the grease in the foil and throw it out). Add potatoes to a small pot and cover with water. Bring to a boil; reduce heat, cover, and simmer for 10 minutes, or until soft. Drain. While the potatoes are cooking, melt butter over medium heat in a soup pot. Stir in onions and cook until tender and translucent. Add flour to make a roux and whisk it until combined - cook for one minute. Add 1 cup water and whisk until there are no lumps. 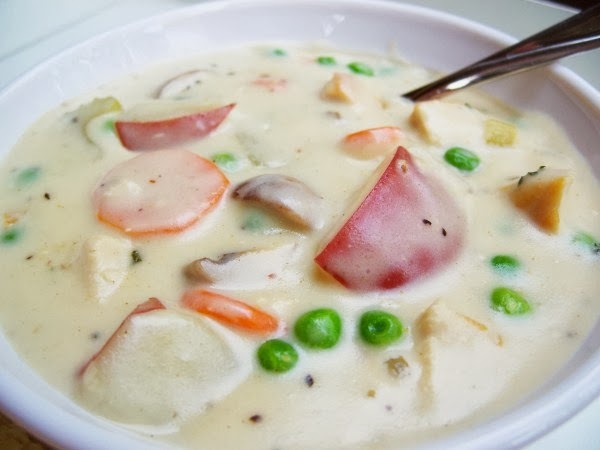 Add milk, chicken base, cooked potatoes, and garlic and simmer until thickened, stirring very frequently. 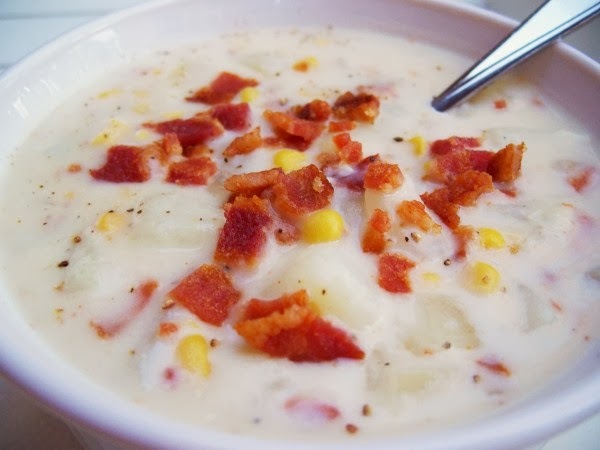 Add bacon and corn and heat through. Add a dash of hot sauce or cayenne and salt and pepper to taste.